It is very simple more sharing of your content means higher ranking in search engines. So you must focus on social media websites. Google plus is the best for the business. Try to get more plus one's on your post because it will increase your page authority and your page will appear in search results. Along with more Facebook sharing and retweets. So how to check your blog popularity among the fellow bloggers. Here are 3 tools through which you can figure out the entire blog popularity as well as your post popularity. Secocentro has social media link popularity tool through which you can know how popular your blog is. In results it shows how many real tweets, Facebook sharing and plus one your post and your blog has received. Type your blogger blog link or link of any post and it will show you all results related to social media sharing. Moonsy is another great tool that shows your blog popularity and your link popularity. It is an alternative of seocentro. It is very easy to use and fast in loading. 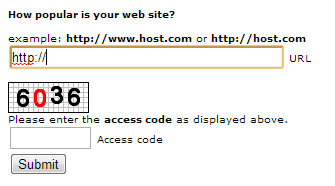 Type your url and hit the check button and you are done. Quicksprout is another alternative for social media link popularity checker tools. It also shows SEO score, speed score and how your website will look like in mobile as well. It is like a mix veg having many tools embedded in one. A must try tool. This will show the weakness of your website which you can improve for a better user experience. What are the meta tags they are using. What are the page sizes of your competitors website. Number of internal links on homepage. Length of title and meta tag. How the website will look like in mobile and tablets. So it shows a complete analysis of your blog. Along with on page optimization tips for your blog and SEO recommendations for your blog. So these are must use tools. I used these tools and I was shocked to see how many mistakes I was doing. I corrected them and the result is more traffic. Do you really want to increase your blogger blog traffic and want your website to appear in google search results than give these tools a try and tell us our story. If you enjoy this post about 3 online tools to check your blogger blog popularity then please share it and give us your feedback. Thanks for landing here and reading this article. 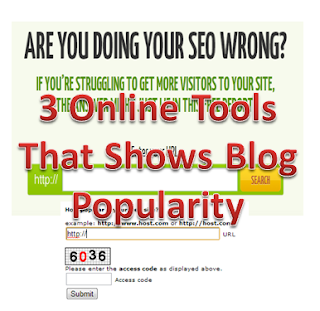 Description : Check your blog popularity with these awesome online tools. Do you know How popular is your blogger blog. Compare your blog with your competitors.